Many people today are turning to a diet of high protein low carb foods as a means to lost weight. A high protein diet plan is thought to change your metabolism so that your body burns its own fat instead of carbohydrates. 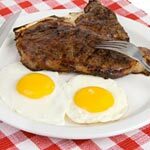 Meat, poultry, fish, eggs and dairy products are staples of a high protein low carb diet. “Carbs” or carbohydrates are found in starchy vegetables like root vegetables and in things made from grain like bread and pasta. Sugar is a carb, so one might also call this kind of eating plan a low sugar low carb diet. Before starting on this kind of diet, it is very important to speak with your health care professional. High protein diets can cause or exacerbate medical problems for some people, especially those with kidney disease, heart conditions, or diabetes. Once you have medical clearance you will want to make a list of your favorite high protein low carb foods. Food labels are an excellent way to learn. Carbohydrates, protein and fats are all listed on the label with how many grams of each is in a serving. Be sure to notice portion sizes when you are making your list of high protein low carb foods. Here is a list of examples of high protein low carb foods along with the grams of protein, so you will have a decent idea about what to eat on a high protein diet.